The teams at Hicklin Door Services and Garaga proudly work closely with general contractors and architects to provide support and resources for your next garage building or renovating project in Des Moines, Ames, Johnston and Waukee, IA. We can help analyze your needs and requirements anywhere from the number of operational cycles and insulation demands to natural lighting and maximum headroom, just to name a few! We provide take-offs, free estimates, and shop drawings to meet any schedule, as well as free consultations with Garaga engineers through a dedicated technical support hotline. There are numerous measurements to consider when designing a residential garage door opening. 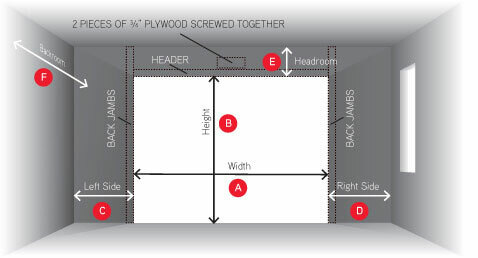 Please download our worksheet to guide you through the most important measurements for your garage door opening. Many residential Garaga doors can be installed for less than $1000, but the exact cost depends on sizes, options, and other particulars of your project. We are happy to work with you to customize your door to fit your budget and needs. For more pricing information please contact us by filling out our online quote request form. We strongly recommend that installation is performed by our garage door experts, however if you decide to do it yourself, please download Garaga’s residential garage door installation guide.